Seldom in the annals of history do we receive a chance to meet our heroes…even more seldom do we get the opportunity to question them about the art they make that inspires us. What follows is the tale of one of those most rare historical instances. On Tuesday July 30th I was lucky enough to win a ticket to see a double screening of Hot Fuzz and The World’s End thanks to the Awesome Fest. Wait I have yet to mention the Pièce de résistance, a question and answer session with Edgar Wright, Simon Pegg and Nick Frost! If you don’t know those names please google them and then return to reading this article in jealous awe. Unfortunately in order to make sure they gave out the maximum amount of tickets to well deserving fans the Awesome Fest awarded me with a single ticket. This meant that I had to figure out how to get to Philadelphia from my home in the Winterfell of Pennsylvania. I called some friends but unsurprisingly none of them were interested in driving me to Philly and then waiting five hours for me to see two films. So with a pocket full of dreams and a round trip ticket I hopped a train and rode the line over to the city of Brotherly Love. Before jumping into the awesome Question and Answer session I should like to point out some awesome moments in my adventure around Philadelphia. 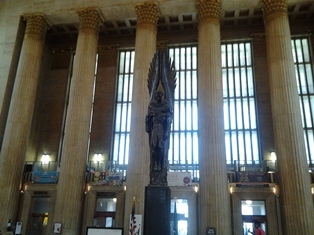 First 30th street station is awesome! The architecture is really mind blowing. Secondly Brave New Worlds Comics on 2nd Street just may be the best comic store I’ve even encountered. It is deceptively small but upon entrance you find a mind blowing selection of comics, figures and all things nerdy. I killed a good amount of time in there just perusing the store and talking to the purveyors who happened to be discussing the World’s End screening I was seeing later in the evening. I also left with some comics I had been desperate to get my hands on. Rick Remender’s newest issue of Uncanny Avengers and the first volume of his work on Uncanny X-Force; along with that I picked up the first issue of Scott Snyder’s the Wake which is an intriguing little horror story so far. 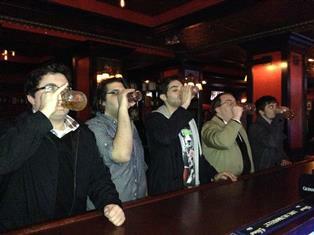 After that I bummed around some Philly landmarks and made my way to the Ritz East for my screening. I was lucky enough to wait in line with some friendly fellow geeks who were forced to bond because as I already mentioned we each only had one ticket so none of us were accompanied by friends. Due to them my two hour wait breezed by and I had a friend to hold down my seat and watch my stuff when I went to the bathroom. There was an awesome little question and answer session before the film where some people received free posters and T-shirts. Unfortunately I was not one of them despite knowing the answer to all of the movie related trivia. 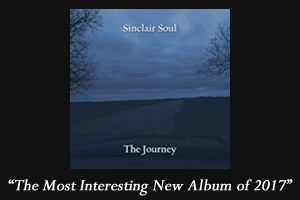 I was lost on the local radio station stuff. Anyway I’ll stop boring you with the small stuff and jump to the Q and A which took place right after the screening of Hot Fuzz and the World’s End. 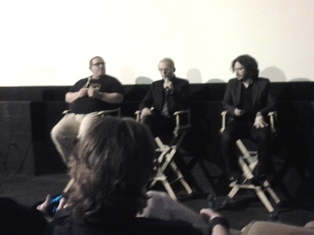 Edgar Wright was the first person to enter the room followed by Nick Frost and Simon Pegg. They arrived to an enthusiastic theater. I sat exactly one row away from them in a sort of awe. I can’t adequately explain how awesome it was to see in person three of my favorite film makers who I’ve enjoyed since I first discovered Shaun of the Dead at my local blockbuster back in 2004. That night I sat alone in a beat up recliner and laughed my head off. Since then they’ve all become huge stars. Edgar Wright is set to direct Ant Man for Marvel Studios after the phenomenal Scott Pilgrim Vs the World and Nick Frost and Pegg have appeared in various awesome movies in the years since. So maybe you can see why I was just so happy with the moment. Strangely I didn’t fear to raise my hand to ask a question which is unusual. I’m never the kind of person who actually does the question section of a question and answer session but this time something was different. I actually had a pretty good question that popped into my head while watching the World’s End. Adding to my confidence was the fact that Frost, Pegg and Wright all seemed like genuinely smart, nice and insightful film makers. So I cast my hand into the finite sea of arms and hoped I was picked to converse with my heroes. I was initially supposed to be the third question but unfortunately the moderator skipped me and I was forced to keep my hand suspended in air. There is yet another piece to this story though. I had to catch an 11:59 P.M. train back to my home and the Q and A started after 10:30 P.M. I wasn’t sure how long it would run and I had to ride the subway back to the train station so I knew I had to leave by 11:15 P.M. at the latest or be forced to spend the night in the 30th Street Station of Philadelphia. Thus I waited in abject horror hoping time didn’t run out forcing me to awkwardly become the only person to walk out of the Q and A through a packed theater and Pegg, Frost and Wright. Luckily none of that happened as I was picked as the second to last question. Now was my time to shine! “I just wanted to thank Mr. Wright for re-tweeting my pub crawl picture”. And I quickly responded without much thought, “I got smashed” and a little laughter erupted from the crowd to my excitement. I moved on to my next order of business by telling Simon Pegg how much I enjoyed reading his auto-biography Nerd Do Well and asked him if he was planning on doing anything more with the mini-story inside of it involving his robot butler Canterbury. This might be some breaking news but he informed me that he was actually writing a sequel to Nerd Do Well focusing on that exact mini-story. So happy with my responses I prepared to dive into my actual question about the World’s End but in my excitement I had forgotten someone…someone who chimed up. “I loved you in Pirate Radio.” Again laughter ensued and I actually couldn’t hear for a few moments. When the commotion died down I asked my actual question about the World’s End. If you haven’t seen the movie yet this next part is a HUGE SPOILER so don’t read it unless you’ve read our review or seen the movie already! I asked Edgar Wright about the metaphor of the robots essentially franchising planets. There’s a moment in the film earlier when the characters remark about how Starbucks is making everything the same and erasing all sort of originality this is basically what the robots are doing to Earth in preparation for its joining the ‘network’. Although I really shouldn’t say robot as robot actually means slave and oh no I’ve slipped into reference humor; hope you all got that one. 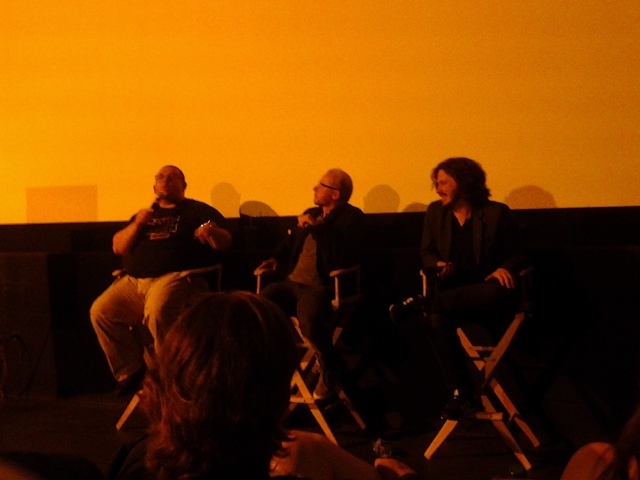 Anyway it sort of looked like Edgar Wright, Simon Pegg and Nick Frost were the only ones in the room who actually understood my question as I got sort of blank stares from most everyone else. It was a pretty amazing second because I realized the film makers who I saw as totally different and living in unique universes separate from me were completely on my wavelength in this one brief moment. Wright explained that it was inspired by what he saw happening in his hometown where a Starbucks had popped up and ruined a bit of the atmosphere the town had. He even digitally removed it from Hot Fuzz, which was shot there. Simon Pegg then jumped in and started discussing many of the different metaphors in the film many of which really blew my mind and will be discussed in my World’s End review. On that note I better wrap this gigantic article up since all my sad research tells me no one even reads this far through articles anymore. I eventually had to run to catch my train home which I happily did. My one regret from the evening is that I didn’t get to tell Nick Frost that when I took the picture that Edgar Wright re-tweeted of me and my pals recreating an image from the World’s End I posed as his character Andrew. Nutshell Reviews are a collection of very short reviews of the most significant movies, books, music, and video games, from both the present day and days gone passed.